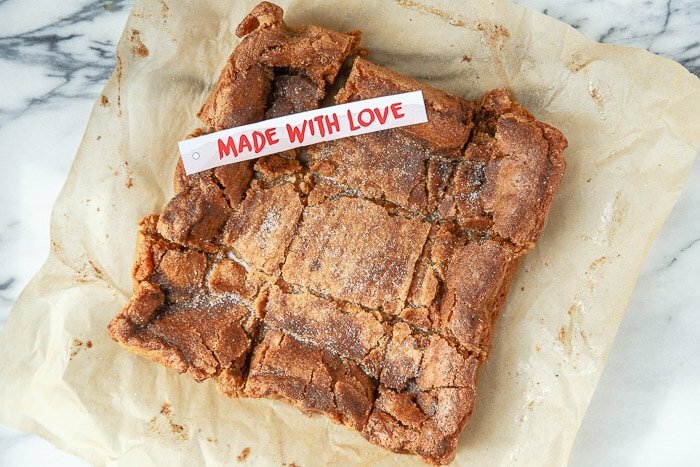 Or, as I like to call these cookies: ooey gooey chewy chai bars. Think of this as the biggest slap in your face of chai ever. You know, if a slap in the face was pleasurable. I am a complete chai freak. I don’t drink coffee much, so chai is my morning beverage of choice. I make my own chai in large batches (the recipe is in my second cookbook), and I love to make a cup first thing in the morning. I have a hard time stopping at just one cup, but if I make a cuppa and eat a chai bar, my chai quota is met for the day. Or, at least until 3pm. Then, I slice off another sliver of chai bar, and let it melt on my tongue. I can’t get enough sweet spice! My chai has fresh ginger, peppercorns, cloves, crushed cardamom pods, and cinnamon sticks. I included all of those spices in these bars, but in their dried and ground form. So, since it’s the holiday season, also known as the time of year when we share all the cookies, I’ll be sharing slightly larger batch recipes. I know, hold the phone. But here’s the thing: I like to share! This recipe is made in an 8 x 8 pan<–there’s a link to my favorite pan. You can get 6 or 9 bars, depending how you slice them. I normally make bars in a loaf pan for two servings, but it’s the holidays: let’s live it up! 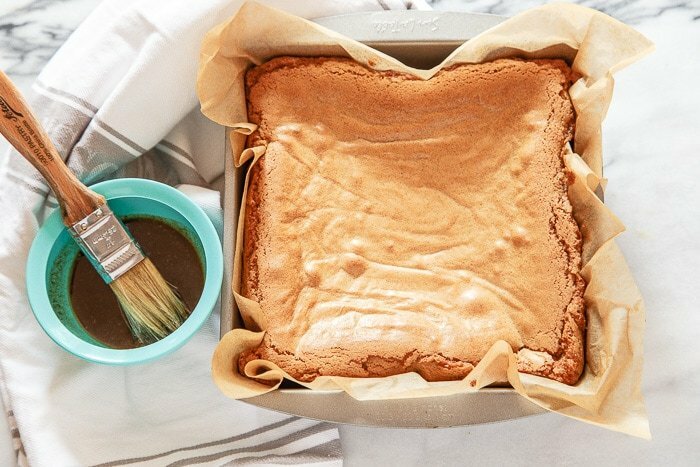 Side note: you can definitely double this recipe and make it in a 9 x 13 pan if you’re really into sharing. If your little eye is admiring those cute recipe tags, you can print them here. I made these chai cookies for Better Homes & Gardens holiday cookie exchange. They’re calling it the world’s largest cookie exchange, and it’s so full of sugar, I’m giddy just to be invited. If you need some inspiration, there’s a whole pin board dedicated to the best holiday cookies ever. If you make one of the cookies, share it with the hashtag #BHGCookieExchange. I would love to see! I adapted their Cinnamon Bars recipe to make these Chai Cookies. And I’m so glad I did. 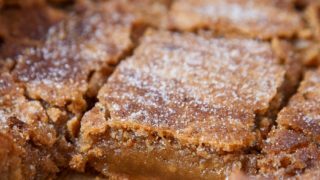 These chai cookies bars are actually really easy: they don’t require a mixer, and the ingredients are pretty basic. If you can stir things together and slop it in a pan, you can totally do this! I love this recipe because it calls for melted butter. Sometimes a cookie recipe calls for softened or room temperature butter, and my butter is in the freezer. And then my right eye starts to twitch because I want, need, gotta have a cookie rightfreakingnow and the butter will take ages to soften. It’s a sigh of relief when a recipe calls for melted butter, am I right? Ok, so first make your spice mixture. Mix all the spices together, and then reserve 1 teaspoon for the topping. Then, whisk together your dry ingredients in a bowl: the flour, spice mixture (less 1 teaspoon), baking soda and baking powder. Then, whisk together your wet ingredients in a separate bowl: melted butter, vanilla brown sugar, and eggs. Easy, no? Stir the dry ingredients into the wet ingredients. 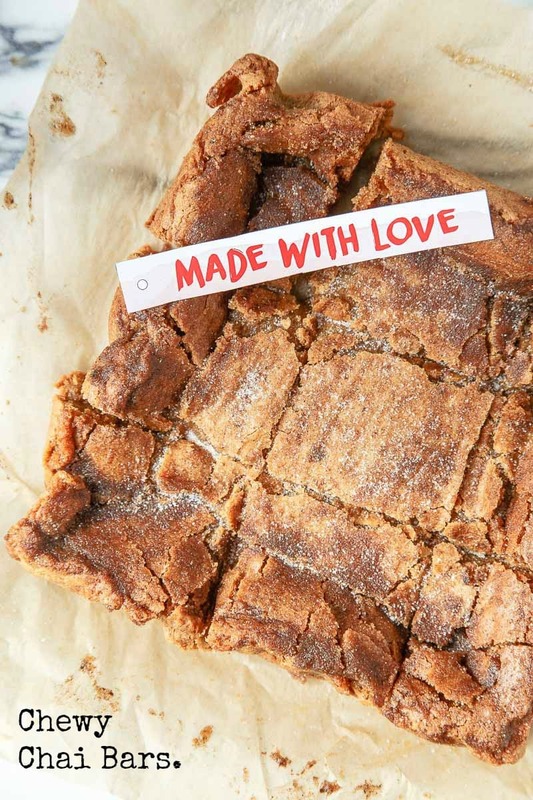 No hand mixer required for this cookie bar! The batter is incredible spoon-to-mouth. But don’t do it. 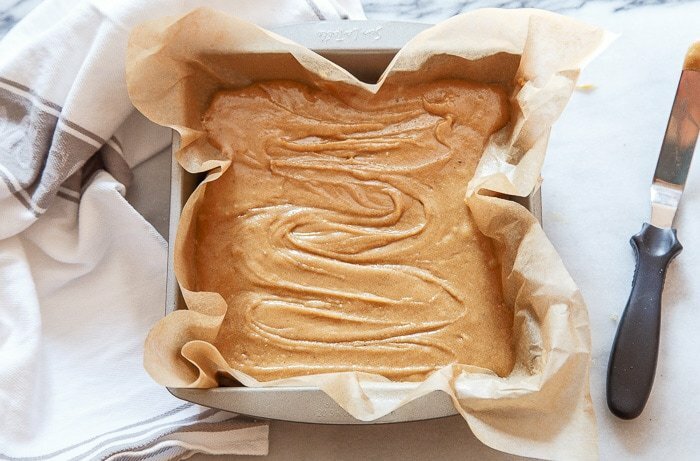 Spread the batter in an 8×8″ pan. Stop licking the spoon! I see you! Bake at 350 for 25 minutes, and then start testing with a toothpick. You want the insides to be soft and gooey, but not wet. The toothpick will have some moist crumbs clinging to it. I poked these bars in at least 37 places, but then I photoshop’d the holes out so you wouldn’t think I was weird. And now you definitely think I’m weird for photoshopping holes. Now comes the fun part: melt the butter, granulated sugar and reserved spice mixture. Brush it all on top with your best artistic flare. You are an artiste! Don’t let anyone tell you otherwise. Let the top dry, slice them into chai cookies chunks, and decorate with cute labels. Share if you want. Call me if you don’t. Preheat the oven to 350, and line an 8x8" pan with parchment paper or foil to prevent sticking. Combine all of the spices together in a small bowl, and set aside. 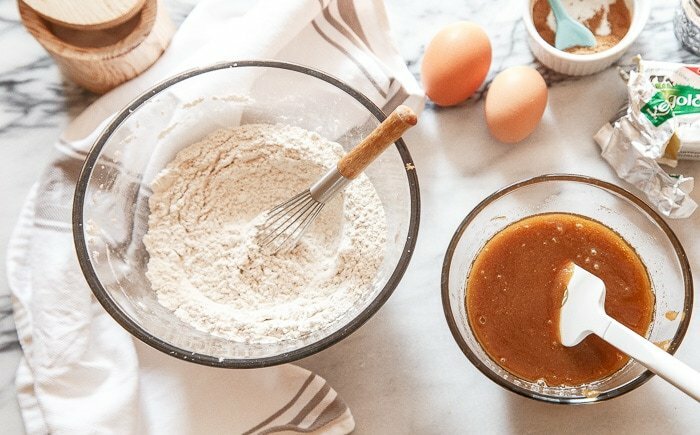 Next, whisk together the flour, all of the spices except 1 teaspoon (reserve it on the side for topping after baking), baking powder, and baking soda. 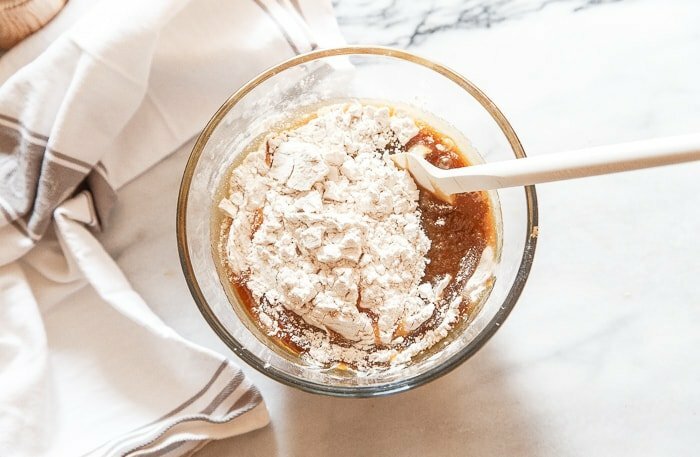 In a separate bowl, whisk together the melted butter, brown sugar, eggs, and vanilla. Pour the batter into the prepared pan, and bake for 25 minutes. Start testing the bars at 25 minutes--you want them to bake but still be soft in the center. Wet crumbs clinging to the toothpick are okay. While the bars are still warm, make the topping: Melt the butter. Stir the granulated sugar and reserved spice mixture into the butter and brush on the bars. Let cool, slice, and serve. I’m a chai freak too!! This suits me perfectly! not sure what i enjoy more: your snazzy sense of humor (its not a mean feat to write about stirring, baking and pouring in a pithy way!) or your scrumptious baked goods. glad, i don’t have to choose. Wow, you are totally, TOTALLY forgiven. 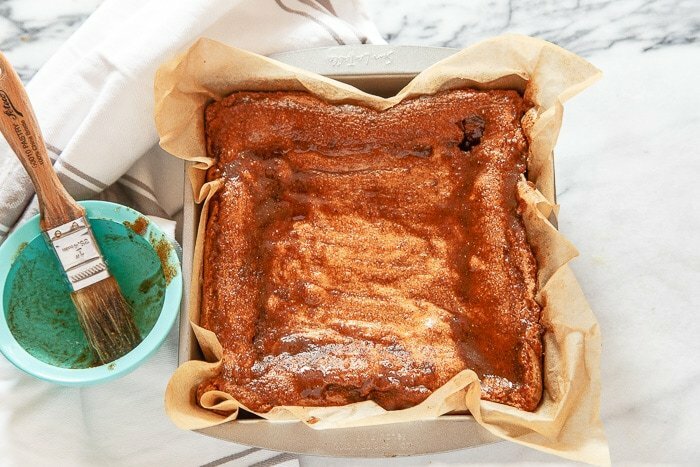 These bars look amazing and so deliciously gooey! I absolutely loved your recipe ! 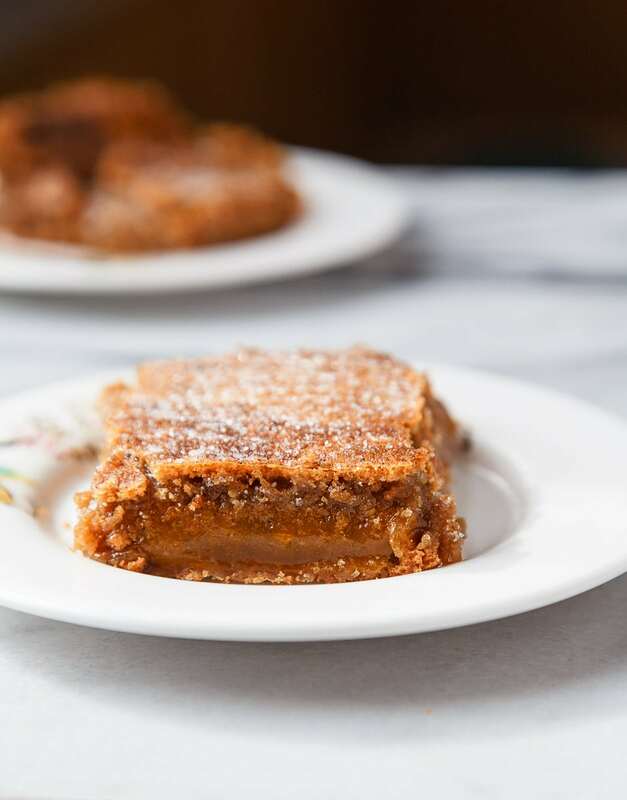 Just wanted to clear up one thing, chai is tea, what you’re making is masala bars inspired by your masala chai . So gooey and with all these spices.. Have to try them! These look delicious! If I want to make a full 9×13 size pan of these, should I increase the recipe by 1.5 or double it? Thank you! This is brilliant and I’m kind of bummed I didn’t think of it, because I just want to eat an entire batch RIGHT NOW! These are so yummy, made them last night! Great idea. Question – when I did the glaze it was more clumpy than runny/brushable so I wondered about the quantity of butter vs. sugar? I added about a tablespoon of water and microwaved it for 20 seconds and then it was just like your looked – brushable. And perfectly glazey. Delicious! Hmmm, Sarah. I have no idea why that happened. I’m so sorry! I’m glad a splash of water helped! I’m here years late, but the same thing happened to me as well! I just ended up speading mine with a spoon instead of a brush. Next time I’ll try what you did. Love this site, your right there are a lot of flavors out there and I need to make sure my honey bunny eating homemade. And what s more homemade then chai oatmeal bars. Absolutely agree that the batter is delicious all on its own. My house smells so good now! Two things that didn’t come out the same for me- one, my topping was also super clumpy, more like wet sand than brushable, and I didn’t even use the whole 1/4c of sugar. I added more butter and it worked, but I think next time I’ll cut it down to 2T sugar to 1T butter. Second, my bars did not come out gooey at all. It came out like a lovely moist spice cake with a delicate, velvety crumb. It is delicious and I have been enjoying it with tea, but it wasn’t the soft bars I was expecting. Something about my oven heat/egg size/ingredients must have been different, though I have no idea which. Still tasty, and will totally make again! What is the correct measurement for the butter? On the Pinterest site that links to here, it’s says 3/4 cup, on here it’s 2/3? My whole family loved these bars – next time we will probably make a 9 x 13. I decreased the pepper to 3/8 of a teaspoon because I felt weird putting pepper in bars. :-) Next time I will put the full amount in. I also decreased the sugar in the bars to 1 1/2 cups (just because), and they had a good amount of sweetness – not overly or underly sweet. I also cut the sugar in the topping in half. My topping was, like the other reviewers, more on the “wet sand” side, so I added a little water and it was perfect. Great bars, Christina! Thanks for the recipe! Have you seen the pin on how to soften butter quickly? You heat water in a glass in the microwave, dump out the water, and turn the heated glass upside down over the butter stick. It supposedly softens the butter in a couple minutes without melting it…. butter problem solved! Thanks for the easy and Amazing recipe Cristina ! I was super excited to try this recipe (planned on taking it to a potluck the next day). I have no idea what happened but my top and sides (a thin border) cooked fine, but the middle was still the same consistency as the batter. I even ended up baking for another 20 minutes(+), and it never cooked. I went over the recipe twice and was hoping it was operator error, but I had followed it correctly. And I know our oven is fine. So I am hoping someone can come in and help me resolve this. Hi Michele! Did you let them rest on the counter and still have the issue? If you look at the photo, the center is supposed to be super gooey. I kinda think it’s the best part. But yeah, you can’t eat them right away. They should probably be refrigerated before cutting, and I’ll update the recipe now to reflect that. Sorry for your trouble! Great flavor here! Some family members were hesitant to try bars with chai flavor, but we all liked them in the end. They would have been tasty without the glaze as well- I loved the soft texture of these! Made these last night, and I am a fan. I didn’t cook them quite long enough, and they are too gooey but the flavour is amazing and am assuming they would bake being firm and chewy at the same time next time when I bake them for longer. I was skeptical that they could be really that chewy instead of cakey (which I don’t like). The flavour was perfect. I had the same problem with the topping but just added some hot water to thin it out. 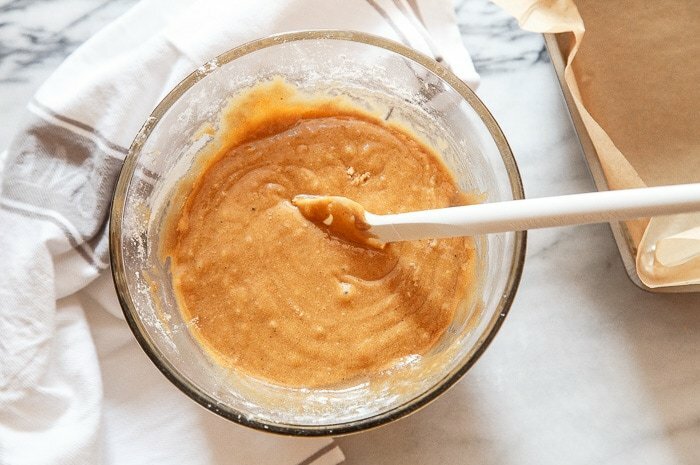 My wife and I tried this recipe and let me tell you all some things, they work out to be about a thousand calories each. They’re as dense as a collapsing sun, and have more sugar than a plantation in the 18th century. Buyer beware on these bad boise, you might get diabetes just reading the recipe. I cut them into smaller cuts, so I got probably 16 mini bars. I definitely plan to make these again for my work Christmas luncheon! I had the same issue with the topping as mentioned above, so I think I’m actually just going to skip it next time. They’re delicious without, too! I saw that other versions of this made them in a bigger pan so I used a 9×9 square pan. Even then it was very gooey inside which is good but I think I will bake them longer next time. 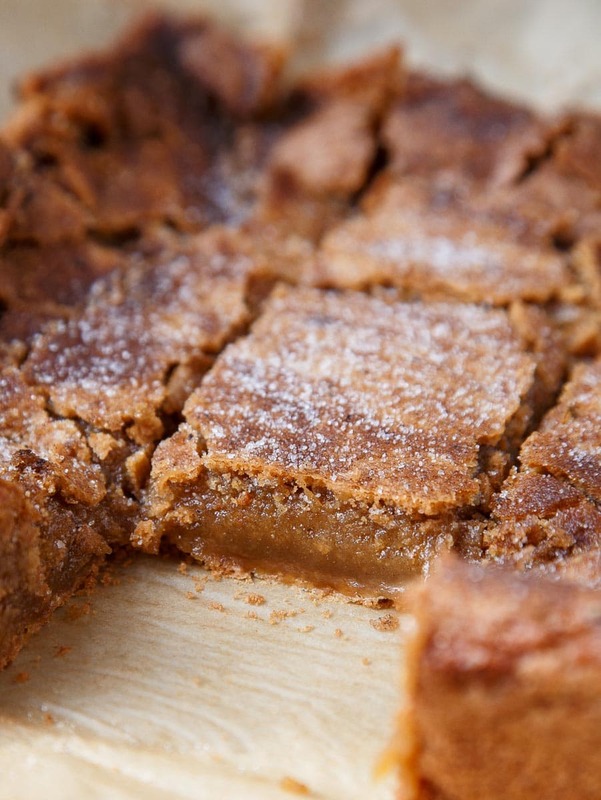 I really was craving a chai dessert so thank you for the recipe!